drive a taxi [a truck] タクシー[トラック]を運転する. He drives his car to work. 彼は自分の車で通勤する. I will drive you home [to the station]. お宅まで[駅まで]車でお送りしましょう. Water drives the mill. 水が水車を回転させる. The machine is driven by electricity [compressed air]. その機械は電気[圧搾空気]で動く. Drive the dog away. その犬を追い払え. He drove the cattle to the fields. 彼は牛を野原へ追っていった. They drove the sheep in. 彼らは羊を中に追い込んだ. She drove him back. 彼女は彼を追い返した. drive a person into a corner ⇒corner 名詞 4. They drove the enemy from the country. 彼らは敵を国外へ追い払った. His wife's death drove him to despair. 妻の死で彼は絶望に陥った. Her son's death drove her out of her senses. 息子の死で彼女は狂乱状態に陥った. Hunger drove him to steal. 空腹に迫られて彼は盗みをした. I was driven to resign. 辞職するはめに追い込まれた. 〔+目的語+補語〕〈人を〉〈…の状態に〉させる，追いやる 《★【用法】 補語として主に mad，crazy，nuts，insane などが用いられる》. His whistling nearly drove me crazy 彼の口笛で気が狂いそうになった[まったくいらいらしてしまった]. Her inane remarks drove me insane. 彼女のばかげた発言で頭がおかしくなった. The gale drove the ship on to the rocks. 疾風に吹きつけられて船は岩礁に乗り上げた. The wind drove the rain against the windowpanes. 風が雨を窓ガラスに吹きつけた. 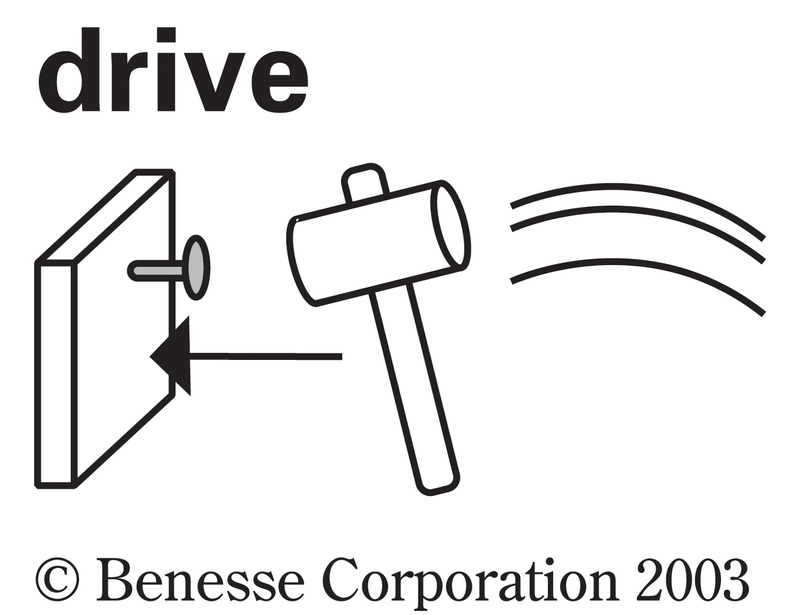 Drive the nails home [into the plank]. くぎを十分に[その板に]打ちつけなさい. drive a lesson into a person's head 教訓を人の頭にたたき込む. drive a tunnel through a hill 山にトンネル[坑道]を掘る. drive a tunnel under a river [strait] 川[海峡]の底にトンネルを掘る. drive a railway across [through] a desert 砂漠に鉄道を通す. [通例 hard を伴って] 〈人を〉こき使う，酷使する; 厳しく訓練する. 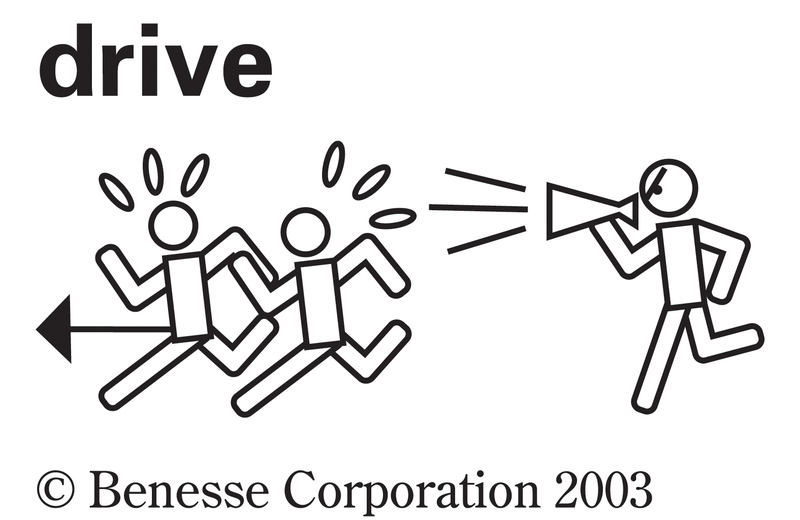 drive one's employees hard 従業員を酷使する. drive a roaring trade 盛んに商売を営む, 商売繁盛である. drive a good bargain 割りのよい取引を行なう. She drives very cautiously. 彼女は実に慎重に運転する. Shall we walk or drive? 歩こうか, それとも車で行こうか. We are just driving through. 私たちは(止まらずに)ただ素通りするだけだ. She got into her car and drove off. 彼女は車に乗り込み走り去った. He drove right up to the front door. 彼はすぐ玄関先まで車を乗りつけた. This car drives well [easily]. この車は運転しやすい. The car was driving on the wrong side of the road. その自動車は道路の反対側を走っていた. The ship drove on the rocks. 船は岩礁に乗り上げた. The clouds drove before the wind. 風に追われて雲あしがひどく速かった. The rain drove in his face [against the window]. 雨は彼の顔に[窓に]激しく降りつけていた. I wonder what he is driving at. 彼は一体何をしよう[言おう]としているのだろう. take [go for] a drive ドライブに出かける. take a person for a drive 人をドライブに連れていく. It's a long drive from New York to Boston. ニューヨークからボストンまで車で長時間かかる. The village is an hour's drive outside the city. その村は市から車で 1 時間ほどの郊外にある. a man with great drive 迫力にあふれる人. He has a lot of drive in him. 彼はすごい馬力がある[がんばり屋だ]. 不可算名詞 [具体的には 可算名詞] 【心理】 (自然のままの人間の)衝動(力), 本能的要求; 動因. Hunger is a strong drive to action. 空腹は人間を行動に駆り立てる強力な動因である. a Red Cross drive for contributions 赤十字募金運動. a drive to raise funds 基金募集運動. This car has front‐wheel drive. この車は前輪駆動である. 不可算名詞 【自動車】 (オートマチック車の変速レバーの)ドライブ[走行]の位置 《略 D》. 可算名詞 [修飾語を伴って] 《主に英国で用いられる》【トランプ】 (…の) トーナメント式競技，…ドライブ. The rain drove me inside. The local people tried to drive the gang out of town. The teacher tried every means to drive the bees from the classroom. The strong wind drove the boat against the rocks. Cherry petals were driven into my room by the gust. The test results drove her to despair. Failure drove him to drink. With his statement about foreigners the governor has driven himself into a corner. The way he acts drives me wild. The death of her husband drove her mad. Hatred drove them to take up weapons and fight. He is really driven to win. Could you drive me to the airport? He drove his car over the fence into the water. The new engine is driven by solar energy. The coach has been driving us into the ground lately. I drove a bargain with the dealer when I bought the car. He drove the ball right through the trees and into the lake. He drove the last nail into his newly finished boat. I had the lesson driven into me when I was a boy. They drove a tunnel through the mountain. Did you drive or fly to Sapporo? Drive carefully in the rain. Let's go driving around town. A red sports car drove against the wall. The yacht drove smoothly before the wind. The rain was driving hard against the window. He kept driving till he became the champion. She tried to drive the boss's doubts away by appearing to be a good worker. The riot police drove back the demonstrators. May I drive you back? Despair drove her back on drinking. The instructor tried to drive in the importance of basics to the members. He drove in two runs in the ninth to win. A lady picked up a couple of things at the store and drove off in her red Porsche. We were able to drive off the dogs by throwing sticks. His words drove me on to become a teacher. They drove out the cat from the kitchen. The fear of a gas shortage drove up the price. Let's take a drive to the marina. It's about a 30‐minute drive to the office. The exclusive boutiques on Rodeo Drive attract many visitors. Be careful when you back out from the drive onto the street. The children started a charity drive for the victims of the flood. Could you drive up to the gate? Automatic cars are easy to drive. The rain drove us inside. The local people tried to drive the cult out of town. The teachers tried every means to drive the bees from the schoolyard. Driven by jealousy, he began to watch his wife's every move. Can[Do] you drive a car? We used to have a lot of steam-driven locomotives. He is really [highly] driven to win. You'd better stop driving yourself so hard or you'll end up in hospital. They're driving a roaring trade. We drove a (good) bargain with the dealer when we bought the Mercedes. I had the lesson driven into me[myself] when I was a boy. His debt drove him back on what little money he had. He drove the message home very clearly. The noise drives me bananas. The company was driven to the wall when the bank rejected the loan. His absence drove his boss up the wall. I have no idea what he is driving at. 【１】 追い立てる, 駆り立てる; 押しやる; 打ち込む. 【２】 《蒸気・電気などが機械を》 動かす; 《機器を》 駆動する. ・The motor drives the compressor. モーターがコンプレッサーを回す. 【２】 推進力, 精力, 意欲; 動機, 動因. 【３】 駆動装置, ドライブ; disk drive. 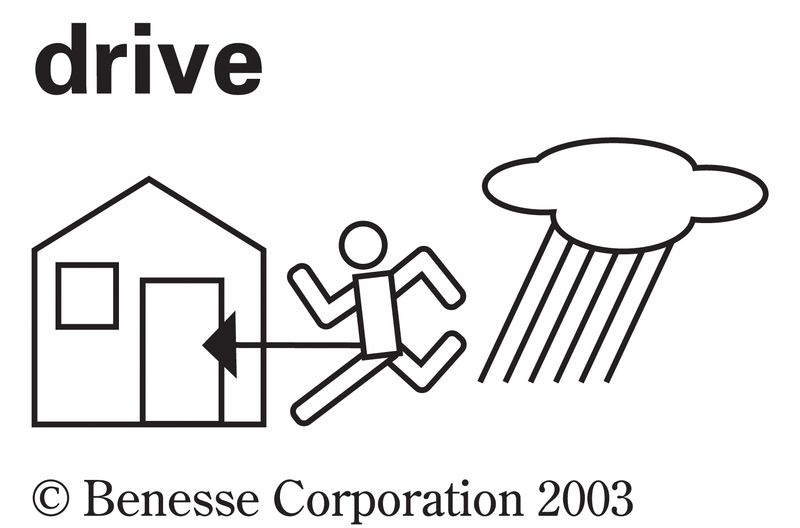 ・The MO drive is lettered H. / The MO drive is assigned a drive letter H. MO ドライブ(のドライブ名)は H になっています. An area of storage that is formatted with a file system and has a drive letter. The storage can be a floppy disk, a CD or DVD, a hard disk, or another type of disk. A hardware device that reads data from and writes data to floppy disks. From Middle English driven, from 古期英語 drīfan (“to drive, force, move, chase, hunt, follow up, pursue; impel by physical force, rush against, thrust, carry off vigorously, transact, prosecute, conduct, practice, carry on, exercise, do; speak often of a matter, bring up, agitate, trot out; urge a cause; suffer, undergo; proceed with violence, rush with violence, act impetuously”), from Proto-Germanic *drībaną (“to drive”), from Proto-Indo-European *dʰreybʰ- (“to drive, push”), from Proto-Indo-European *dʰer- (“support, hold”). Cognate with Scots drive (“to drive”), North Frisian driwe (“to drive”), Saterland Frisian drieuwe (“to drive”), West Frisian driuwe (“to chase, drive, impel”), Dutch drijven (“to drive”), Low German drieven (“to drive, drift, push”), German treiben (“to drive, push, propel”), Norwegian Bokmål drive, Danish drive (“to drive, run, force”), Norwegian Nynorsk driva, Swedish driva (“to drive, power, drift, push, force”), Icelandic drífa (“to drive, hurry, rush”). (米国用法 football) An offensive possession, generally one consisting of several plays and/ or first downs, often leading to a scoring opportunity. 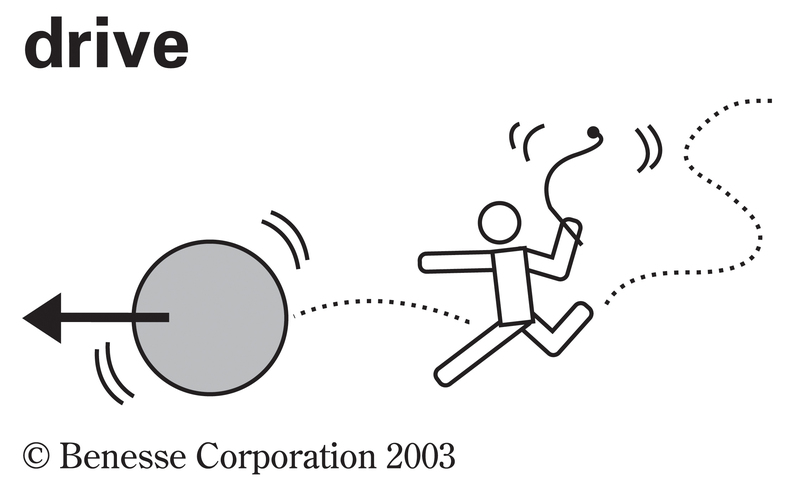 (米国用法 football) To put together a drive (n.): to string together offensive plays and advance the ball down the field. (transitive) To separate the lighter (feathers または down) from the heavier, by exposing them to a current of air.